March | 2014 | The British in Crete, 1896 to 1913. 2nd battalion Cameron Highlanders celebrating the coronation of King Edward Vll. Edward Vll was crowned on 9 August 1902. The flag on the right hand side is the flag of the Cretan Autonomous State. This entry was posted in British Army in Crete, Cameron Highlanders, European Intervention Crete and tagged British Army, Cameron Highlanders, International troops on March 24, 2014 by Mick McT. On 21 February 1897, Cretan Christian rebels, amongst whom was Eleftherios Venizelos, a future Prime Minister of Greece, occupied the heights outside Canea and threatened to open fire on the city with artillery recently landed from Greece. On been instructed by the European Powers to take down the Greek flag that they were flying, the rebels refused and as a consequence the fleet opened fire on them. The rebels withdrew without firing on Canea having suffered three dead and a number wounded. 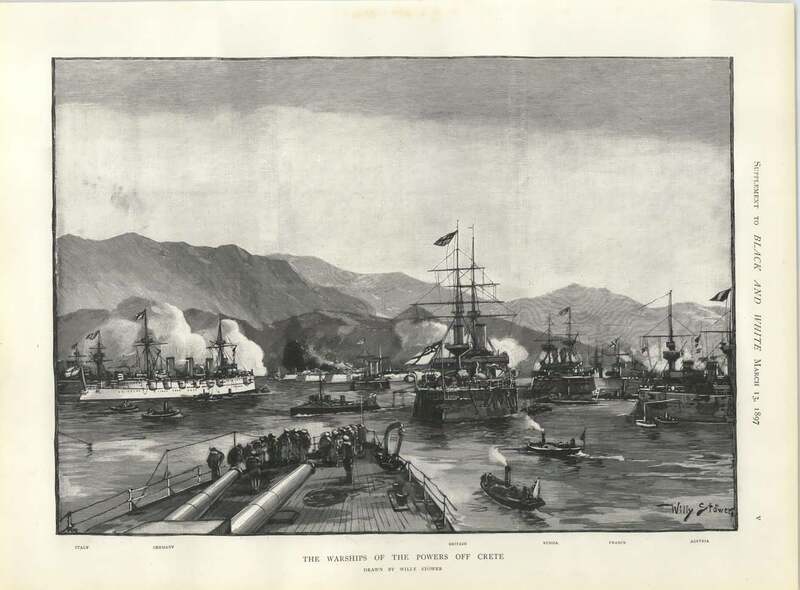 This entry was posted in European Intervention Crete, Naval and tagged Cretan Christian Rebels, Crete 1897, European Intervention Crete, International Fleet on March 24, 2014 by Mick McT. British warships off Canea. March 1897. British ships from left to right: HMS Barfleur, H.M.S. Dragon, H.M.S. Revenge (Flagship Rear Admiral Harris), H.M.S Bruiser and H.M.S. Rodney. 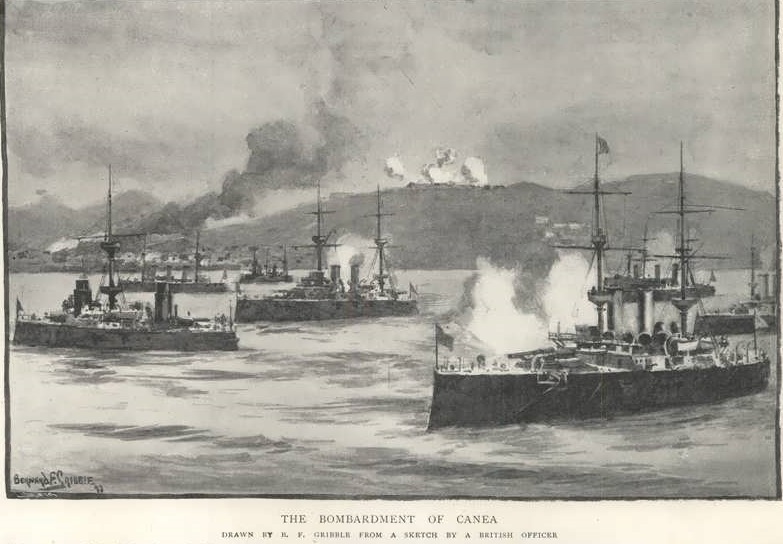 This entry was posted in European Intervention Crete, Naval and tagged British Fleet, European Intervention Crete, H.M.S. 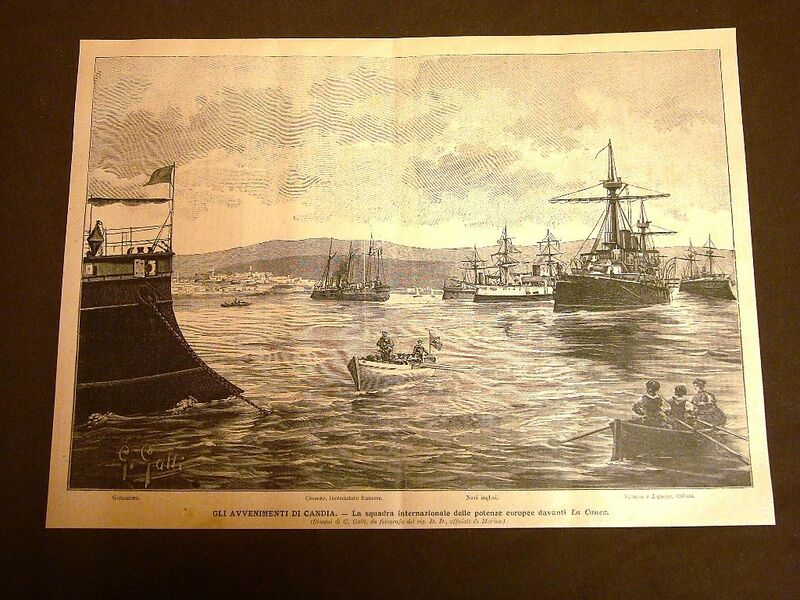 Barfleur, H.M.S. Bruiser, H.M.S. Dragon, H.M.S. Revenge, H.M.S. Rodney, International Fleet on March 17, 2014 by Mick McT. 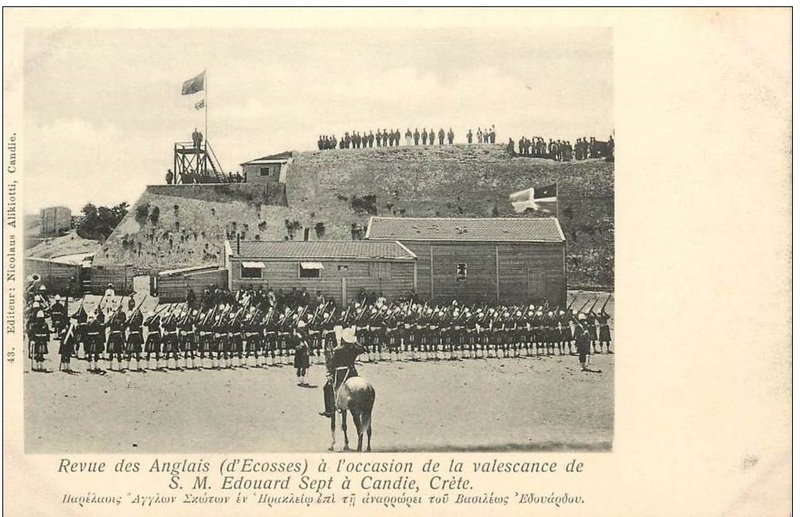 The British troops shown are presumably from 1st Bn. Seaforths and 1st Royal Welsh Fusiliers. Ottoman troops are also in evidence. This entry was posted in British Army in Crete, European Intervention Crete, Royal Welsh Fusiliers, Seaforth Highlanders and tagged British Army, Crete 1897, International troops, Royal Wels Fusiliers, Seaforth Highlanders on March 12, 2014 by Mick McT. On 24 March 1897, D Company (c.100 men) 1st Batt. 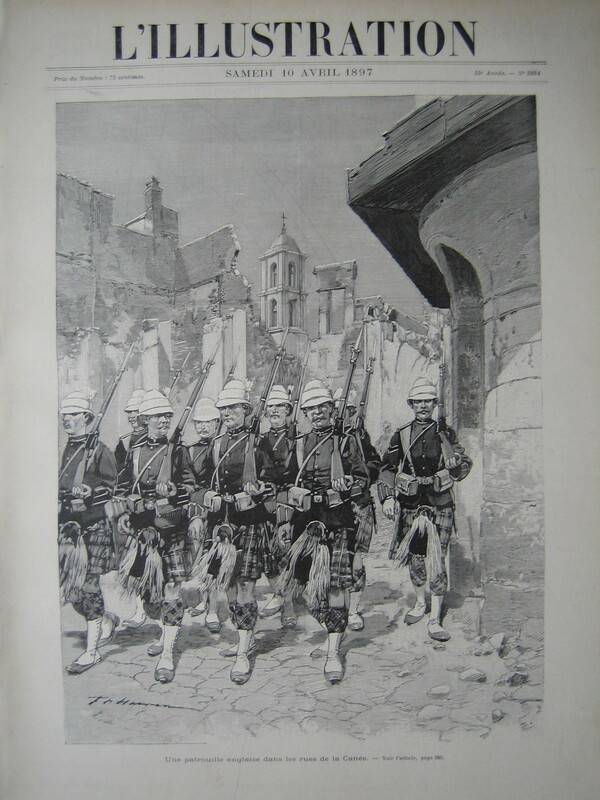 Seaforth Highlanders, under the command of Captain G.G.A. Egerton, landed at Canea; the bulk of the battalion (c.500 men) under Col. R.H. Murray going on to land at Candia (Iraklion). 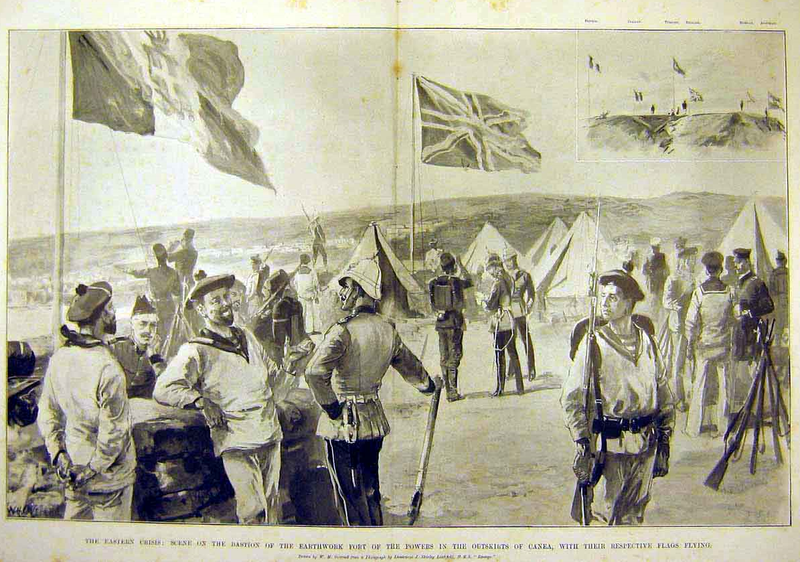 This entry was posted in British Army in Crete, European Intervention Crete, Seaforth Highlanders and tagged British Army, Canea, Crete 1897, European Intervention Crete, Seaforth Highlanders on March 11, 2014 by Mick McT. I think these are supposed to be off Canea. 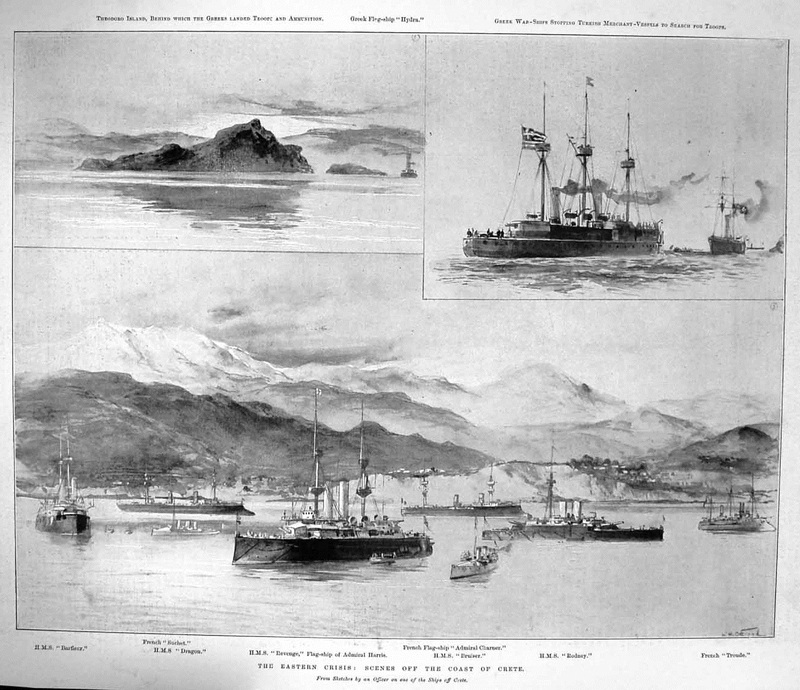 This entry was posted in European Intervention Crete and tagged Crete 1897, European Intervention Crete, International Fleet on March 11, 2014 by Mick McT. This entry was posted in Uncategorized on March 11, 2014 by Mick McT.